The state of Querétaro in central Mexico has long been home to the Otomí or Hñahño people. In fact, the state capital is built on the remains of a 15th Century Otomí village. Today, Otomís live in two regions of the state - Southern Querétaro (the Municipio of Amealco de Bonfil) and the Semi-desert Region (the Municipios of Cadereyta de Montes, Colón, Ezequiel Montes, and Tolimán). Linguists classify the language spoken by Querétaro Otomís as Northwestern Otomí ( ñañu/ñañhu). This regional variation of Otomí is also spoken by people living in the Municipio of Acambay in the State of Mexico. 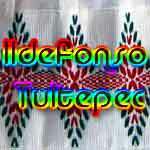 There were 33,000 speakers of Northwestern Otomí according to the 1990 census. Most Otomí people are bilingual in ñañhu and Spanish, but there are some Southern Querétaro Otomí communities with a high level of monolingualism in ñañhu. Most Otomí people in Querétaro (around 27,000) live in over 30 communities in the Municipio of Amealco. 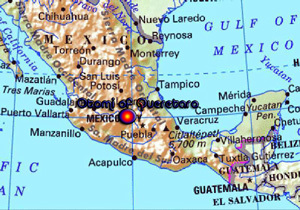 Querétaro Otomís live on a semi-arid plateau that is approximately 2,000 meters in elevation. Many families farm, growing a wide variety of crops. Maize, beans, and chilies are grown, as well as grains such as oats and barley, and vegetables like broccoli and cauliflower. Some families cultivate marigolds, used for fattening chickens; others grow nopales or magueyes for foods and fibers. Raising cattle, sheep, and goats often supplements farming as a source of household income. Querétaro Otomís live in a part of Mexico that has seen a great deal of industrial development as well as large-scale agriculture. Many people leave their communities to work in nearby cities and industrial parks, or to perform agricultural labor in neighboring states. Otomí people also leave Querétaro to work in Mexico's major cities and in the US. Several Otomí communities are well known for the production of crafts. There are extensive deposits of clay near the village of San Ildefonso Tultepec, and around half of the local families make ceramics. Ollas and comales are produced for domestic use, but a wide range of purely decorative items, such as clay jack-o-lanterns and animals, are also made. 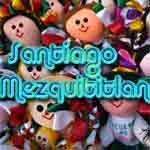 Doll making, once carried out on a small-scale level, has become a major industry in Santiago Mezquititlán. Otomí women selling dolls are seen frequently in Mexico City and other major urban and tourist centers throughout the country. These vendors also sell colorful embroidered items, such as pillow cases and tortilla cloths, made in Mezquititlán. Otomí weavers in Tolimán were formerly known for creating beautiful ikat woven sashes and quechquémitls, but this technique has virtually disappeared among the Otomís. Today, however, Tolimán artisans produce fine crochet work in the form of bags, place mats, napkins and other items. Otomí men traditionally wore shirts and pants made of "manta" fabric - often with embroidered designs - but today generally wear western style clothing. Women in some communities still dress in the traditional costume that consists of a wrap skirt, long-sleeved blouse, woven sash, apron, rebozo, and quechquémitl. Skirts and blouses may be embellished with lace trim or embroidery. In years past, Otomí women of the Semi-desert Region used various tie and resist dyeing techniques to color fabrics for clothing, but these techniques have been lost to time.